It seems like we've been doing fractions FOREVER and I'm ready to be done and move on! 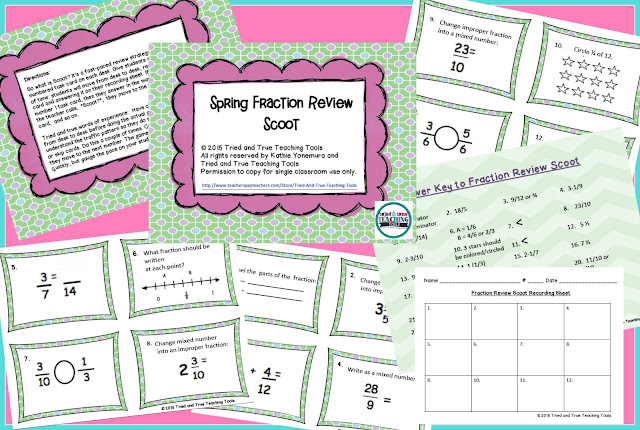 But I need to make sure my students understand the many concepts we covered during this unit so we play a Spring Fraction Review Scoot game. Click on the picture to get this great Scoot game from my TpT store! Be sure to click on the buttons below for more wonderful teaching ideas! Love this, I now know what scoot is. Great explanation. I just know your students have loads of fun learning in your classroom. Thanks, Deann! My kids beg to play scoot (even though it's just a moving version of "drill & kill") Lol; whatever works! Fun game! I'd like to try it with middle school! I'm sure older student will appreciate moving while learning, too! Let me know how it goes! WOW! This looks like a ton of fun especially if you've been teaching fractions for so long. Super cute idea! I've used this concept before but love the "Scoot" name. Thanks for sharing! The kids do love it! Thanks for stopping by, Shametria!! Thanks, Katie. I play with task cards, but I don't play Scoot. I usually tape the cards up around the room and give kiddos a set time to complete as many as possible. I might have to try the more structured version you mention. I'm sure your kids love walking around the room to use the task cards, too!